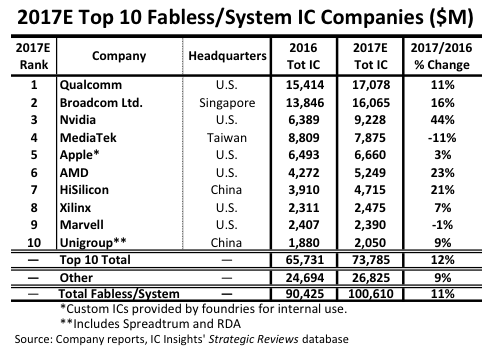 Figure 1 shows the top 10 ranking of fabless IC suppliers for 2017. Two China-based fabless companies made the top 10 ranking last year—HiSilicon, which sells most of its devices as internal transfers to smartphone supplier Huawei, and Unigroup, which includes the IC sales of both Spreadtrum and RDA. Fabless company IC sales are estimated to have exceeded $100 billion in 2017, the first time this milestone has been reached. Unlike the relatively close annual market growth relationship between fabless IC suppliers and foundries, fabless IC company sales growth versus IDM (integrated device manufacturers) IC supplier growth has typically been very different (Figure 2). 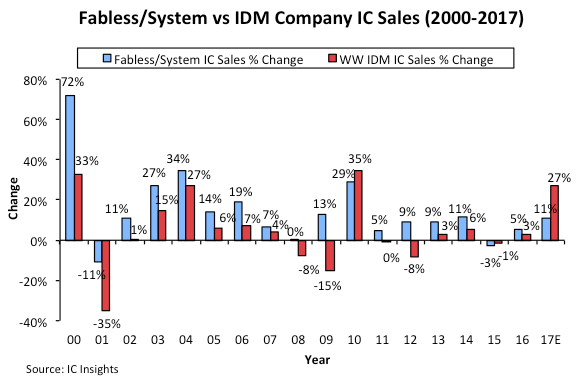 The first time IDM IC sales growth outpaced fabless IC company sales growth was in 2010 when IDM IC sales grew 35% and fabless IC company sales grew 29%. Since very few fabless semiconductor suppliers participate in the memory market, the fabless suppliers did not receive much of a boost from the surging DRAM and NAND flash memory markets in 2010, which grew 75% and 44%, respectively. However, the fabless IC suppliers once again began growing faster than the IDMs beginning in 2011 and this trend continued through 2014. In 2015, for only the second time on record, IDM IC sales “growth” (-1%) outpaced fabless IC company sales “growth” (-3%). The primary cause of the fabless companies’ 2015 sales decline was Qualcomm’s steep 17% drop in sales. Much of the sharp decline in Qualcomm’s sales that year was driven by Samsung’s increased use of its internally developed Exynos application processors in its smartphones instead of the application processors it had previously sourced from Qualcomm. Although Qualcomm’s sales continued to decline in 2016, the fabless companies’ sales in total (5%) once again outpaced the growth from IDM’s (3%). In 2017, the market behaved very similarly to 2010, when strong growth in the memory market propelled the IDM IC sales growth rate higher than the fabless IC supplier growth rate. With the total memory market, a market in which the fabless IC companies have very little share, surging by 58% last year, IDM IC sales growth easily outpaced fabless company IC sales growth in 2017.